A familiar face on the patchwork and quilting scene for many years, Karin Hellaby is founder of the thriving Quilters Haven store in Wickham Market, Suffolk, where she offers not only a vast range of fabrics and supplies but an extensive programme of classes. Karin is also the author of a range of successful books. Stateside, she has taught regularly at the huge International Quilt Festival in Houston and at the world’s largest outdoor quilt show at Sisters in Oregon, where she has been honoured with a solo display of her work. Karin feels extremely privileged to have been able to make her passion her work, commenting, "It's not many people who get to spend all day, every day, doing something they love.” And she feels even more fortunate in being able to combine this with another one of her passions: travel. As the leader of Arena Travel's specialist quilting and patchworking holidays, Karin gets to travel the world, investigating the history of her craft around the globe, teaching as she goes. "My parents are Norwegian and I think maybe it’s the Viking in me that gives me my wanderlust,” says Karin. “I love exploring new places and always have a list of destinations yet to visit! It is also fascinating visiting quilt shows and museums in other countries, seeing what influences are at work and picking up new ideas." Arena's tours and holidays are a happy mix of quilting and patchworking tutorials, given in small groups, visits to quilt shows and sightseeing. Their trips include destinations in the UK and far beyond, with tours to America, Canada, France, Italy, Norway, Spain and Switzerland. Karin believes their recipe for success is bringing together a group of like-minded people who share a common interest, and then providing the opportunity to learn new techniques, see new parts of the world and have fun along the way. Karin is also keen to stress the benefits for both mind and body of combining sewing with travel and relaxation. After all, sewing has been shown to reduce blood pressure and to help relieve stress levels. At her Suffolk base, Karin even has a local doctor suggesting her patchwork and quilting sessions as a way to combat the pressures of modern-day life. "When we work with our hands, we go into a form of meditation and it’s a great way to relax," says Karin. "Escaping the daily grind once in a while is essential, since everyone needs their own ‘me’ time and sewing can offer the perfect solution. Combined with a holiday and a change of scenery the benefits are even more pronounced." 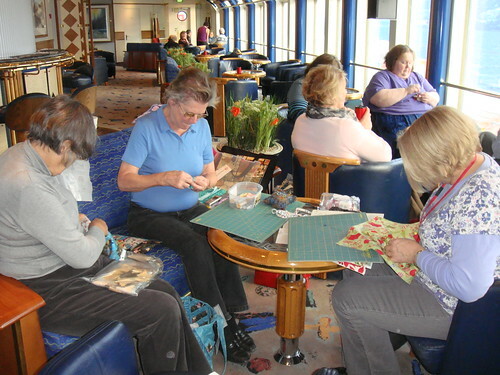 Karin recently returned from a cruise along the Norwegian coastline, where she led on-board sewing sessions while the stunning scenery slipped past outside. 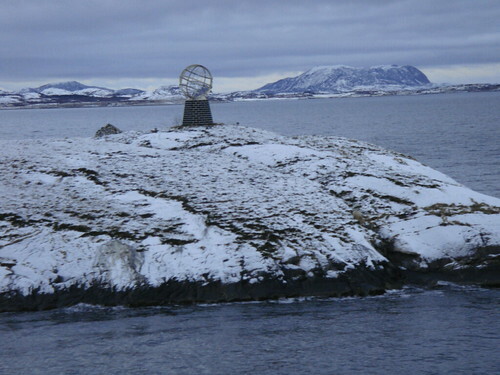 In fact, it was her own experience of visiting her grandparents on the north Norwegian coast that inspired Karin to suggest this trip, which was an unqualified success. "Scandinavia has a strong tradition of needlework", says Karin, "and I think everyone felt inspired by their surroundings.” The group was lucky enough to spot the famed Northern Lights dancing across the sky. An unforgettable sight, the experience motivated some of the group to create some stunning patchwork designs based on the phenomenon they'd just witnessed. Karin works closely with Arena Travel to get the blend of each trip spot on, so not only is the destination right but the teaching that is on offer too. A classic example is the trip to Canada in May 2011, which combined teaching by Karin and Canadian expert Anne Dale, a rail journey across the Rocky Mountains aboard the Rocky Mountaineer, rounded off with a visit to Festival of Quilts - an outdoor quilt show at Calgary’s Heritage Park. Karin is currently working closely with Arena Travel to put together a further range of quilting and patchwork tours for the coming months. For more information, visit www.arenatravel.com or call 01473 660800.